ZIMBABWE is not ready to have its own currency until productivity levels recover to allow for the creation of reserves that will improve the liquidity situation, economic experts have said. Speaking during the 2018 National Budget review meeting organised by The Chronicle in Bulawayo yesterday, economists said dealing with the prevailing cash shortages should be supported by sound economic fundamentals. They hoped the budget statement presented by Finance and Economic Development Minister Patrick Chinamasa last Thursday would tame the cost drivers in the economy and give industry breathing space to grow. The country has been facing a challenge of cash shortages since early last year, forcing depositors to embrace plastic money as scores fail to withdraw their money from the banks. The situation has hit the productive sectors hard as businesses struggle to access foreign exchange to procure critical raw materials. Some of the participants who attended the budget dialogue meeting suggested that the country should bring back its own currency or else adopt the South African rand, which demands that it joins the Rand Union. Those in support of this view blamed cash shortages for repelling investors and weakening business confidence in the economy. However, in his contribution, one of the panellists, Dr Nyasha Kaseke, an economist and University of Zimbabwe lecturer, warned that introducing a local currency at this point in time would be disastrous. "I understand that we're using a currency that we can't influence but first of all we have to improve our productivity. Once we're sustainable in terms of production we can begin to think of our own currency," he said. "As it is, the environment is not yet conducive for us to have our own currency. I also understand that some investors are being scared away because of issues to do with the type of currency we're using but right now we have ourselves to blame because we allowed our own currency to move out of circulation." Dr Kaseke said the country has no adequate reserves to support a new currency and challenged productive sectors to increase output with a bias towards exports. He also said adopting the rand would not be a quick win solution. "The problem of using the rand is that other players in the Rand Union have to accept us first and we have to meet their terms and conditions to be part of the union. It's not a matter of just using the rand as our main currency without adhering to some rules. This also applies to the pula," he said. "That's why Zimbabwe decided not to have a specific currency but a multi-currency system to avoid these terms and conditions. If we adopt the rand it means that we'll not have a monetary policy. Everything will have to come from South Africa. These are some of the problems that we're facing in the country." Earlier, participants had questioned if it was possible for the country's economy to be resuscitated without its own currency. They suggested that it was important for Zimbabwe to have its own currency if it is serious about having investors coming into the country. 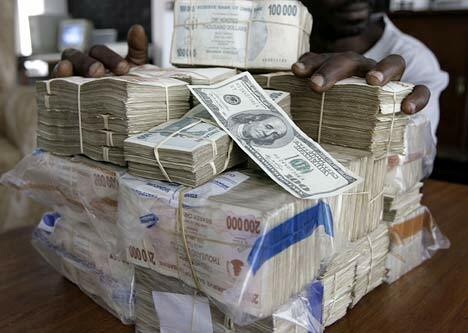 Some bemoaned the loss of value of the US$ in Zimbabwe saying this makes investors reluctant to come to the country.